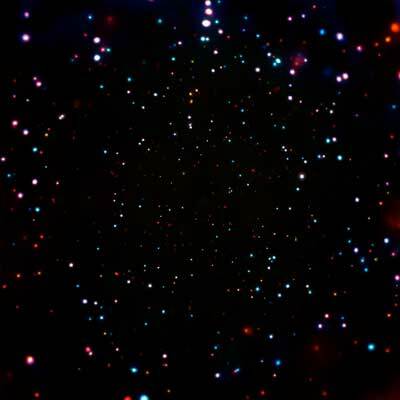 (Nanowerk News) A University of Arkansas researcher is part of a team of astronomers who have identified an outburst of X-ray emission from a galaxy approximately 6.5 billion light years away, which is consistent with the merger of two neutron stars to form a magnetar -- a large neutron star with an extremely powerful magnetic field. Based on this observation, the researchers were able to calculate that mergers like this happen roughly 20 times per year in each region of a billion light years cubed. The Chandra Deep Field-South survey includes more than 100 X-ray observations of a single area of the sky over a period of more than 16 years to collect information about galaxies throughout the universe. Lehmer, who has worked with the observatory for 15 years, collaborated with colleagues in China, Chile and the Netherlands, and at Pennsylvania State University and the University of Nevada. The study was published in Nature ("A magnetar-powered X-ray transient as the aftermath of a binary neutron-star merger").